For intermodal freight, logistic, and motor carrier companies, the TrucBrush® method offers a mobile, fast and efficient solution to removing snow from the tops of trailers and fleets of trucks. Safety – Eliminates the need for truck drivers and other logistic personnel to have to remove accumulated snow and provides snow cleared fleets for improved roadway safety. Accommodates all Truck Heights – The TrucBrush easily adjusts to any height within seconds to accommodate quick change over in truck models without requiring stops and/or ground slowing clearing of recent snow debris, which is often the case with fixed scrapper styled systems. Mobility – This new method in removing accumulated snow allows intermodal freight, logistic and motor carrier companies to assign TrucBrush to multiple onsite locations to quickly and strategically address a facility’s immediate operational need for snow removal of tractor trailer rooftops. Multi-Purpose – Parked trailers with snow accumulation can be cleared quickly in conjunction with road ready trailers to minimize the risk of trailer damage and roof collapses often caused by the weight of heavy snow. During off-season, TrucBrush may be used for onsite ground sweeping. 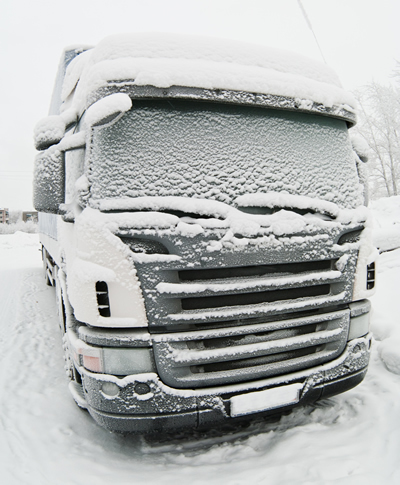 Fast – The TrucBrush method is fast and allows intermodal freight, logistic and motor carrier companies to execute their delivery standards under extreme weather conditions. Economical – The TrucBrush™ method is a cost effective method for clearing snow off the tops of trailer trucks, which addresses transportation requirements for roadway safety and eliminates transport delays and possible fines due to non-compliance of snow removal from vehicle rooftops prior to leaving freight terminals.